Jack Straw has announced he is to run Gordon Brown's campaign for the Labour leadership - the first official confirmation the chancellor will stand. He told BBC One's Sunday AM Mr Brown had helped make the UK a "better, fairer, more prosperous place", and had the vision to deal with new challenges. But ex-Cabinet minister Peter Mandelson told the programme younger Labour MPs should decide on a new leader. The public had "uncertainties" about Mr Brown becoming PM, he said. Mr Blair has said he will step down by September, and is expected to announce his resignation shortly after the Scottish and Welsh elections on 3 May. Mr Brown is favourite to succeed him. Earlier, in a letter to MPs, Mr Straw said the Brown campaign would not begin until Prime Minister Tony Blair had set out his departure plans. MPs Michael Meacher and John McDonnell have already said they plan to stand. It is not yet clear whether they can each secure the nominations of 44 other MPs needed to take part in the election. Mr Straw said there would be a "vigorous campaign" for Mr Brown to take over from Mr Blair. "It is very striking, in the 12 hours since my letter went out electronically... I've had very, very positive responses from a very broad spectrum of the parliamentary party," he said. 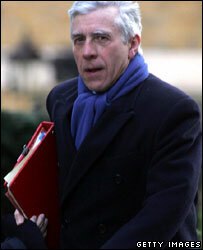 Asked if Mr Brown should go unchallenged to become leader, Mr Straw said he remained "entirely neutral" on the matter. And he scotched newspaper reports of Mr Blair's backing for Environment Secretary David Miliband as new leader as "completely untrue". According to Sunday's Observer, Mr Blair said that if Mr Miliband were to stand "he will win", but sources at Number 10 also denied the claim. Mr Mandelson said it was "obvious" there should be a proper contest to decide who should lead the party after Mr Blair. Asked about the speculation over Mr Miliband, he said he wanted the "younger generation of Labour MPs to decide who they want to see leading the party". He said there was no "innate problem" with Mr Brown becoming prime minister but that "the public have uncertainties" about the way he would operate. In Mr Straw's letter, sent by e-mail to MPs, the Commons leader hailed Mr Brown as "supremely well qualified" to build on the achievements of Mr Blair's premiership. Mr Straw, who jointly ran Mr Blair's successful leadership campaign in 1994, says he will be putting together a team and conducting preparatory work over the coming weeks. But he stressed the "paramount priority" for the party was May's Scottish and Welsh elections on 3 May.